The new storyline in Batman where Jim Gordon is now Batman is excellent. Scott Snyder, Greg Capullo, and team are doing a bat-tastic story that is worth your time. Here is the very short version of events: Batman is presumed dead, so Gotham City has Powers Corp build a Bat-suit so there is a deputized Batman working with the police. 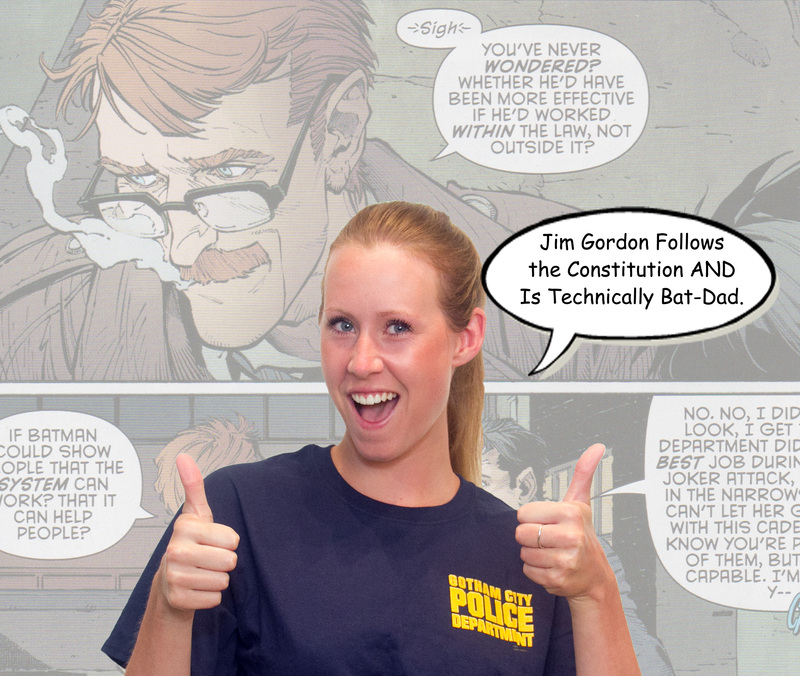 A 46-year old Jim Gordon is convinced to take the job. 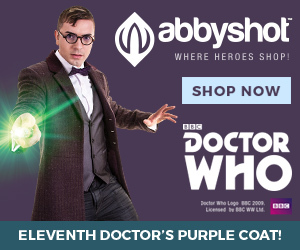 Commissioner Gordon openly wondered if Batman could have been more effective if he had worked within the system. Moreover, a Batman working within the system could show the citizens of Gotham that the system can work. If you believe in the administration of justice and that people become police officers to help others, this is the story for you. Gordon’s Batman is deputized, just as Batman was in the 1966 Batman The Movie (except there are no noble porpoises sacrificing themselves to stop a torpedo from killing Batman). Scott Snyder should be commended on writing a story that incorporates modern technology into the world of comics. Citizens can download the “Bat-App” and let anyone within a 200-foot radius know they need help. This serves as an alert system for the new Batman to respond to those in danger. Private persons may assist law-enforcement officers in effecting arrests and preventing escapes from custody when requested to do so by the officer. When so requested, a private person has the same authority to effect an arrest or prevent escape from custody as the officer making the request. He does not incur civil or criminal liability for an invalid arrest unless he knows the arrest to be invalid. Nothing in this subsection constitutes justification for willful, malicious or criminally negligent conduct by such person which injures or endangers any person or property, nor shall it be construed to excuse or justify the use of unreasonable or excessive force. N.C. Gen. Stat. § 15A-405. For the protection of human life and property during an emergency, the sheriff may deputize orally or in writing such number of additional special deputies as he deems necessary. If he is unable to continue the services of such special deputies without compensation, he may pay the compensation of any such special deputies in such amount as the board of supervisors may determine for each day any such special deputy is actually engaged in assisting him in the performance of his duties, or in assisting any other sheriff who has declared a state of special emergency, pursuant to the provisions of section two hundred nine-f of the general municipal law, with the permission of the sheriff who deputized him. NY CLS County § 655. Could the Gotham Police Department deputize someone to be in a 10-foot tall Bat-suit? I think yes. 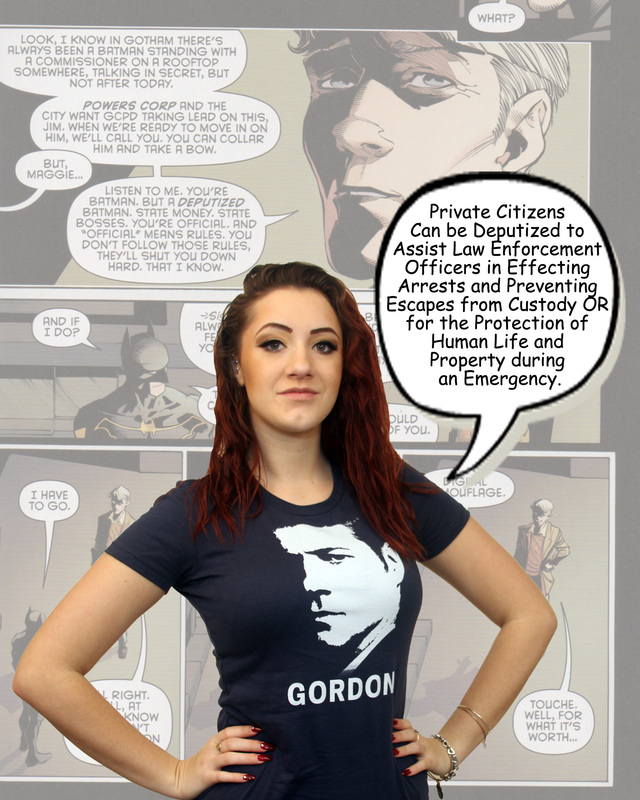 In a world with super-villains, having a deputized super-hero following the law, and working with the police, would provide the state goal of public safety and ensure the Constitution is being followed.